Next time you are passing through or alternatively choose to make a day of it head to Adelaide River for the atmosphere of the local Pub, the Adelaide River Inn. The Inn welcomes locals, visitors and travellers alike. The Inn, The Pub or "303 Bar" as it has synonymously become known, forms a large part of the Adelaide River Resort Complex. Situated directly behind the PUMA Service Station the Inn is surrounded by lush tropical gardens, shady trees and well-manicured lawns. It is centrally located to many tourist attractions in and around Adelaide River Township and its surrounds. At the Inn we offer something for everyone, warm hospitality, great bistro food, and family atmosphere to enjoy them. Adelaide River is steep in WW2 history and the naming of the '303 BAR' reflects this history. The 303 rifle being the weapon of choice by the Australian Army in WW2. The "303 BAR" is located in the main building directly behind the PUMA service station along with the reception desk and adjoins the 'DIGGERS BISTRO". The "303 BAR" is no fancy cocktail bar; it is an old style country pub with a lot of history, charisma and charm. There is cold beer on tap, bottled spirits, beer and mixed drinks in stubbies or cans plus soft drink. Open daily except Christmas day. Within the building you will find pictures and memorabilia of the pub’s and town’s history. 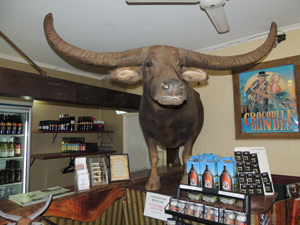 “Charlie” the buffalo made famous as the buffalo Mick Dundee (Paul Hogan) hypnotizes to the ground in the movie Crocodile Dundee can be found standing proudly at one end of the bar. “Charlie” was an Adelaide River resident until sadly passing away in the year 2000 of old age; he is fondly remembered by NT locals, travellers and movie buffs alike. Outside the doors of the '303 BAR" is a 100 seat undercover, outside dining and relaxing area, further out is a large grassed and tree shaded beer garden a great place to sit and relax while the children play on the lawn surroundings. 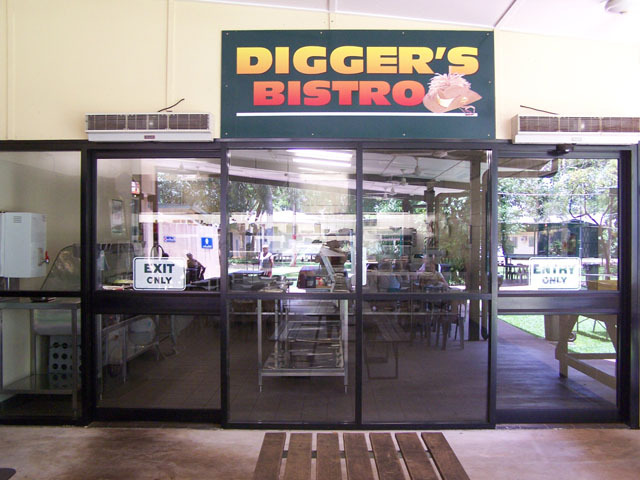 The "DIGGERS BISTRO" is located adjoining the "303 BAR' directly behind the PUMA service station. Serving up a variety of dishes from old country style favourites to more modern style meals. Famous for its local wild caught barramundi there are still many other flavours and dishes worth trying one of which would be the buffalo. One local residing at the Bar who is not so talkative is "Charlie" the Buffalo. Charlie, made famous by Mick Dundee (Paul Hogan) whilst being hypnotised to the ground on the movie Crocodile Dundee passed away in 2000 and now stands proudly on the bar. "Charlie" is available every day for your perfect photo.